Stylish, spacious and a thoughtful design - 34 Latrobe Street will suit the requirements of professionals and modern families looking for low maintenance living in a convenient and sought after location without compromising space or quality. A study is positioned at the front for those who work from home. This comfortable space is useful too as a guest bedroom. There is a third shower downstairs. Family members will be spoilt for choice when selecting their favourite living space or chill out zone. There is an open plan living & dining area that flows out to the private and tranquil alfresco. Downstairs too, a separate activity room and on the upper floor, a third living area/retreat leading out to a balcony that is shared with the main bedroom. The master suite enjoys a separation from the additional three bedrooms that can all accommodate double or queen beds and generous mirrored sliding robes. 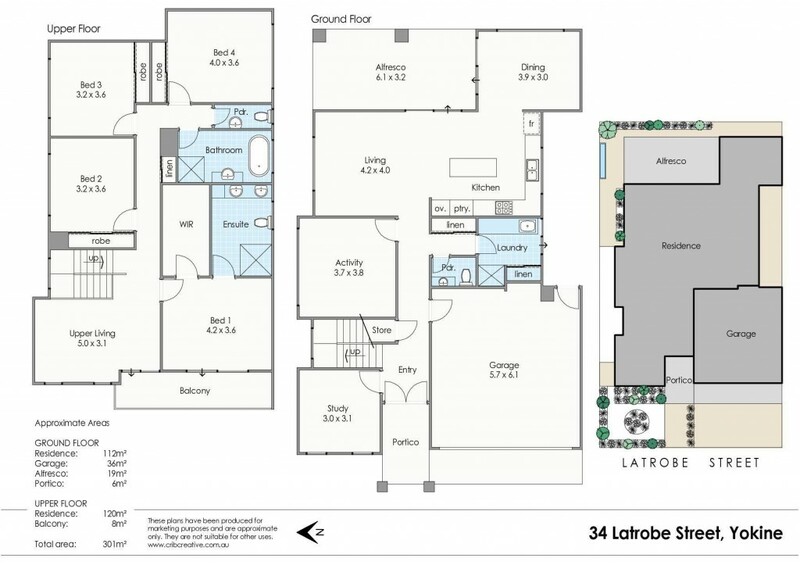 34 Latrobe Street is a stroll around the corner to the ever popular Wordsworth Reserve. Conveniently located to Coolbinia Primary School, Mount Lawley High School & Edith Cowan University. Public transport, Flinders Square Shopping Centre and the cafe precincts of North Perth and Mount Lawley are so close.